Keeping up with this election season's robust trend of jaw-dropping absurdity, the main focus of the second GOP debate will not be politics, but instead something completely obnoxious and unnecessary (you know, in addition to Donald Trump). The backdrop of CNN's GOP debate stage incorporates an airplane. Yup, you read that right. A goddamn airplane. But this isn't just any airplane — it's former U.S. President Ronald Reagan's defunct Air Force One. Why Reagan's plane? 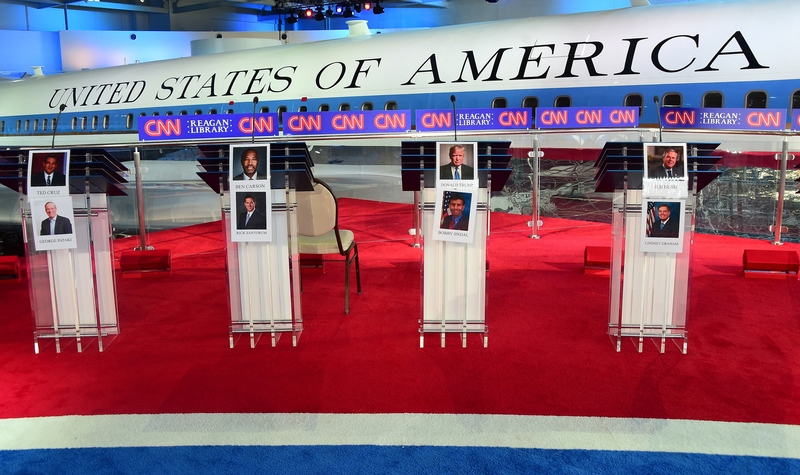 Well, in an effort to "set the scene" for the presidential hopefuls, CNN has decided to place the massive contraption right in the center of the action, to serve as a reminder of the Republican Party's (Read: Reagan's) legacy. It will loom in the background in all its hulking, shining titanium magnitude, suspended from the ceiling for all of us to stare at. Luckily for like 100 underpaid and overworked movers, the plane is staying exactly where it is. Since it was almost-too-conveniently already displayed for public viewing, CNN did the unwieldy job of bringing the debate to it at its home in the Ronald Reagan Presidential Library in Simi Valley, California. They built scaffolding high enough for the debate that Trump's hairpiece will be just level with the plane's wings. 1. "Oh wow. I wasn't prepared for visitors." 2. "And you have CAMERAS. Oh God. OK. I don't have any polish on ..."
3. "Um, this looks important. Am I important? I haven't been important in so long. #startedfromthebottom #wemadeit"
4. "Can someone please explain to me who all these old guys are and why they are here?" 5. "What's wrong with that one's hair? I'm literally above him and I can't tell where it ends or begins." 6. "Someone tell the weird hair guy to stop touching and pointing at me. It's making me uncomfortable." 7. "Ooh, ooh! Yes, I was Ron's plane! I miss him too. There will never be a president like Ron. He was the best. I'm so glad other people feel this way." 8. "Of course I'll take a selfie with you." 12. "Sigh. Yes, yes. You're totally holding me up with a finger right now. Very imaginative." 13. "Must we, with the yelling? This is a library. Have some respect." 14. "I actually really like Hillary. That Texts From Hillary blog? Hilarious. Get it. 'Hill-arious'?" 15. "Oh come on. That was funny. You're all kind of being a bunch of Negative Nancies, and it's really killing my vibe." 16. "Please don't slap my hull. It's degrading." 17. "You know, I wasn't going to say anything. But what if I rolled up into your house unannounced to use you as a powerful metaphor? Hm? Would you like that? I didn't think so." 18. "This is rude. Just totally rude." 19. "At least I'll have a good story for the guys at the hangar later." 20. "Whoa, 15,000 followers on Instagram. I guess I'm famous now. That's pretty cool, I guess." 21. "Does Chipotle deliver at this hour? I'm done."